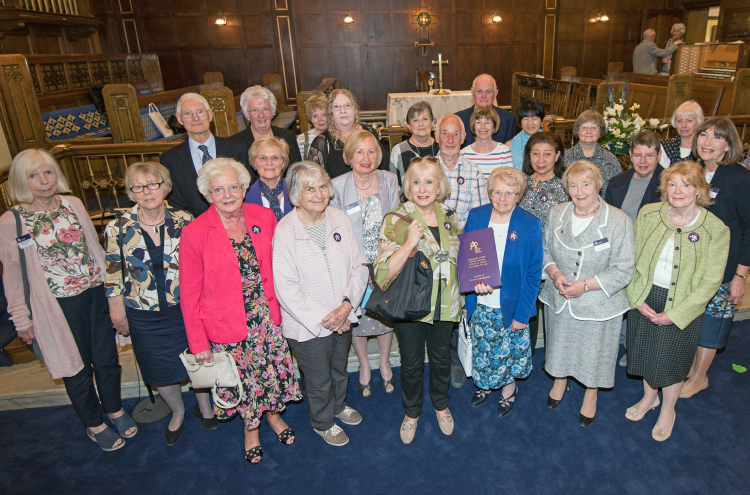 Following nearly six years’ work by volunteers from The Arts Society Fylde at Fairhaven United Reformed Church in Lytham St Annes, the Church Record was handed over at a ceremony on 6th May 2018 during the Sunday Service. Beautifully bound and gold blocked with 119 pages, the Church Record details each item within the church and its history. It includes items such as memorials, metalwork, stonework, woodwork, textiles, paintings and windows, enhanced with 93 photographs and line drawings. Reverend David Phillips was delighted to receive the record: “…a snapshot of the interior of the church as it is today, a special place for individual reflection and shared acts of worship. The record will be a marvelous way in which current and future Church members would be helped to understand the history in their surroundings”. As well as the copy presented to the church, digital copies have also been given to the Lancashire Records Office, the V&A Museum Art Library, and Historic England Archives, where they can be used by researchers and historians. The painstaking work of recording each item in the church was done as part of a national project. Since 1973, The Arts Society’s Church Recorders have undertaken a vital role in recording the past for the future by promoting recognition and preservation of our rich artistic heritage, held in places of worship of all denominations and religions, throughout the United Kingdom. To date, 1908 churches in the UK have been recorded by 2,000 recorders. The iconic White Church, as it is known locally, is a prominent feature of the landscape, with its all white faience slabs, typical of a Byzantine or South West French Romanesque style, and with an interior that is a marriage of Edwardian Baroque and stained glass. Designed and built about 1907-1912 by Scottish Architects, Briggs, Wolstenholme and Thomety, it is now a Grade II listed building. A prominent feature of the White Church is its beautiful stained glass windows comprising images and scenes that shed light on the central drama of Christian salvation. Images of many great reformers such as John Wycliffe, Martin Luther, William Tindale, Oliver Cromwell, John Milton, George Fox, John Bunyan, Isaac Watts, John Wesley, David Livingstone and William Carey are depicted. Whilst recording in the church the group observed that the stained glass windows were never static. During the course of the day they were animated by changing light, their patterns wandering across the floor, inviting your thoughts to wander with them. Just as in ancient medieval churches they are essential to the fabric of this church, illuminating the building and the people within, both literally and spiritually. Small wonder that The Arts Society Fylde selected this church for its first Church Recording project.